Food trucks are an integral (and fun!) part of the Austin experience. Why not bring this unique element of the local dining scene to your next meeting or event? 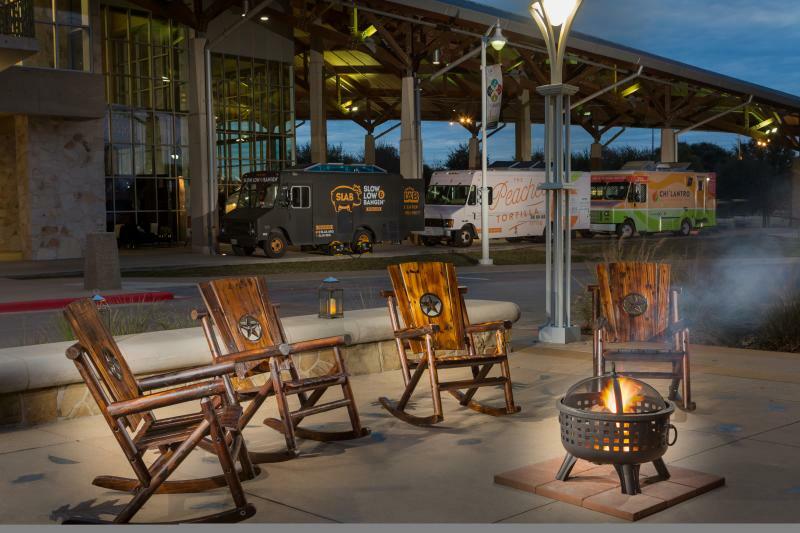 You can surprise your attendees with everything from breakfast tacos to lip-smacking Texas barbecue. Here are some food truck ideas to whet your appetite. Courtesy of the Austin Convention Center. The Peached Tortilla offers street food with an Asian flare. Unique offerings include the JapaJam burger layered with sweet tomato jam, a fried egg and Japanese barbecue sauce; the Pad Thai taco with chili-garlic-marinated chicken that’s stir fried in a traditional pad Thai sauce; and a Banh Mi bowl tossed with Vietnamese braised pork belly, sriracha mayo and cilantro-lime rice. Wake up attendees with a migas breakfast taco from Veracruz All Natural, named one of Food Network’s Top 5 Tacos in America. Veracruz was founded as a taco truck by sisters Reyna and Maritza, who honed their cooking skills working in their mother’s restaurant in Veracruz, Mexico. Fresh, organic ingredients are key to their migas breakfast taco, which folds eggs, avocado, tortilla chips and cheese into a house-made corn tortilla. Lucky Lab Coffee Co. is a mobile coffee bar that can deliver a much-needed morning or afternoon java jolt to your attendees. Serving coffee from local roaster Third Coast Coffee, menus (and even themes) can be customized to your event. Besides options like espresso and lattes mixed with syrup flavors such as white chocolate and caramel, Lucky Lab also offers lemonade, flavored iced teas and a variety of pastries. Slab BBQ & Beer offers a twist on traditional Texas barbecue, incorporating cooking influences and flavors from Memphis, Alabama and the Carolinas. Slab has been featured on the Travel Channel and Food Network for its famed Notorious P.I.G. pulled pork sandwich topped with mustard slaw, along with its award-winning barbecue sauces. 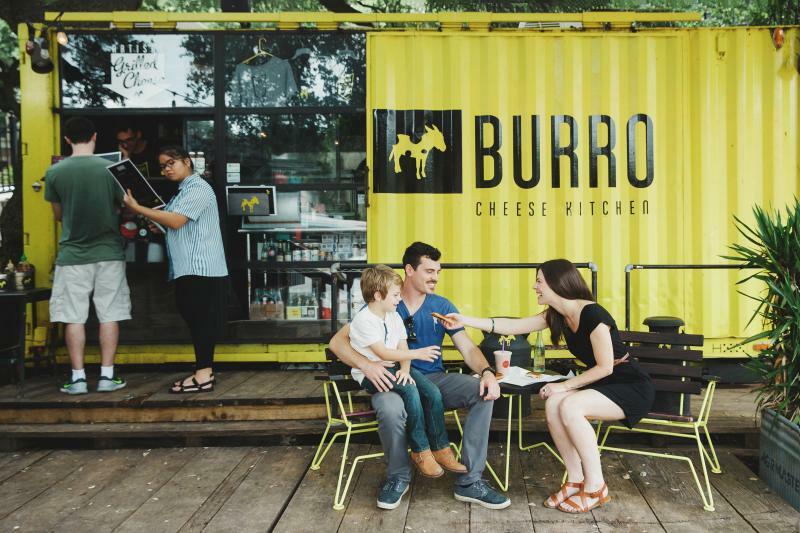 Nothing says comfort food like a gourmet grilled cheese sandwich from Burro Cheese Kitchen. Artisan cheeses and breads are used to create mouth-watering masterpieces like the Long Tall Texan (aged cheddar cheese, brisket and serrano-pineapple sauce on sourdough bread) or the Waylon & Willie (gouda and cheddar cheeses, caramelized onions, peppercorns and spicy maple-bacon sauce on sourdough). Sides include a refreshing gazpacho. Chi’Lantro is known for its fusion Korean-Mexican barbecue. Tacos, burritos, salads and bowls (both rice and sweet potato noodle) can be filled with anything from beef ribeye to soy-glazed chicken and spicy pork. Toppings include homemade kimchi and guacamole, along with healthful dressings like carrot-ginger and sesame vinaigrette. The Mighty Cone serves its foods in a handy paper cone that makes it easy for your guests to eat and mingle at the same time. One of its most famous dishes is the Hot N’ Crunchy Chicken: white meat chicken tenders encrusted with a mixture of almonds, sesame seeds, chili flakes and corn flakes, wrapped in a tortilla and topped with mango-jalapeño slaw and ancho sauce. Avocado and shrimp versions are also available. Garbo’s serves up New England cuisine with an Austin drawl. Try the fresh lobster roll prepared Maine style (chilled with homemade mayo, celery and a blend of special seasonings) or Connecticut style (warm, brushed with lemon-tarragon butter and sprinkled with scallions). Side it with homemade New England clam chowder and a Maine Root soda and you’re good to go. Still hungry? Discover even more Austin food trucks.